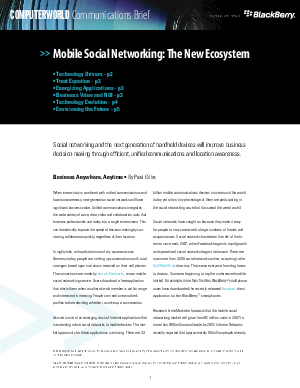 When interactivity is combined with unified communications and location awareness, next-generation social networks will have significant business value. Unified communications integrates the wide variety of voice, data, video and collaboration tools that business professionals use today into a single environment. This can dramatically improve the speed of decision-making by connecting collaborators quickly, regardless of their location. Regardless of where information comes from, the mobile social networks of the future will give users nearly unlimited choice over how they choose to share and consume information. The ecosystem that develops around the next generation of handheld devices will make applications that once seemed fantastic a part of everyday life.